Home » Prevention » Do N95 Masks and Respirators Really Work? N95 respirators, commonly called N95 masks, are air filters worn on the face to capture tiny pollution particles before they can reach the sensitive tissue in your lungs. The effectiveness of N95 masks is controversial, and evidence on both sides of the issue is far from comprehensive. Through my work as a biomedical researcher, I have access to sophisticated air quality measurement equipment, so I ran my own battery of tests to determine if N95 masks are effective medical equipment or a false sense of security. N95 is an efficiency rating from the National Institute for Occupational Health and Safety (NIOSH) that means the N95 mask filters out 95% of (N)on-oil particles larger than .3 microns (.00003 cm). The masks are commonly worn to protect users from dust while working and from air pollution in many large cities, most notably in China. Air pollution has been shown to increase the risk of stroke, heart disease, lung cancer, and both chronic and acute respiratory diseases. At high levels of pollution, those with asthma can be triggered into having asthma attacks. With air pollution, smaller particles are more harmful because they travel further into your lungs before being trapped. Particulate matter that is 2.5 microns or smaller (PM2.5) is the most dangerous to our respiratory health because they are small enough to make it all the way into the deepest parts of our lungs. High PM2.5 concentrations can cause acute symptoms like respiratory irritation, shortness of breath, coughing, sneezing, and runny nose. Those with asthma may be triggered into having an attack. Long-term exposure to PM2.5 pollution has been linked to increases in cardiovascular and respiratory related hospital and emergency room visits. Studies also suggest links to heart disease, chronic bronchitis, reduced lung function, lung cancer, and death. PM10 is another measure of air pollutants that measure between 2.5 and 10 microns in size. Typically, there are fewer PM10 than PM2.5 particles in the air as the larger, heavier pollution falls out more quickly. Stations all over the world monitor air quality in real time. To find out the air quality in your area, search for your city on aqicn.org. What makes a good N95 Mask? This N95 mask was used to tear out old fiberglass for hours in an enclosed space. It still works very well as a filter, despite appearances. The dirt on the inside of the mask comes from leaks around the edge of the mask, not penetration through the filter. In order to filter particles out of the air, the air actually has to pass through the N95 mask meaning the mask-to-face seal has to be good. I discovered that air passing directly through a clean filter is almost completely free of PM2.5 particles (99.95% reduction). Almost all of the dirty air comes through at the mask-to-face seal. Most N95 masks come with elastic straps that go around your head and an adjustable nose clip to create the best possible seal. The 8511V mask that I recommend takes it one step further and features a soft lip that broadly contacts your face, plugging small gaps in the seal. Vented masks are a necessity for comfort, and non-vented masks are only slightly cheaper. The vent is a one-way valve that allows your breath to exit without condensing on the inside of the mask or fogging up your glasses. While it does not make the N95 mask a better or worse filter, it is far more comfortable with the vent. Buy non-vented masks if you are using it to keep your sickness to yourself. While the masks are not designed to catch stuff coming out of your mouth, they will still filter any air that goes through them. With a vent installed most of the air coming out of your mouth does not pass through the filter. Beards are the enemy with any respiratory mask, but particle reduction is the name of the game. An N95 mask does not have to block all particles, so even if there is a poor seal, any air flowing through the filter means cleaner breathing for you. How Long Can I Use the Same N95 Mask? The N95 masks seem to be disposable considering they are lightweight and come in packs of 10, but there are no instructions for duration of use. I measured the air velocity and filtration effectiveness before and after running 4000 cubic feet of dirty air through a piece of mask the size of a penny. The mask was black with dirt, but the air flow rate only slowed a little and the filter was still catching over 98% of PM2.5. These N95 masks clog with dirt and wear out VERY slowly, so even if they are black and nasty the filter will still work. Although the filter is still good, the main source of leakage is through the edges of the mask. As dirt is trapped by the mask, the air passes through the filter more slowly, forcing more air in at the seal. Due to the way that the filter traps dirt (see below), the N95 mask doesn't clog quickly, but it does clog. When dirty air comes through at the seal it leaves build ups of dirt on the inside of the mask. If you're going to reuse the mask, brush out the inside so you don't accidentally inhale it. For those of you wondering what exactly is going on at the microscopic level, I took an up-close look with a Field Emission Scanning Electron Microscope (FE-SEM). If you're not sure what that is, it's a really powerful microscope that can make things look up to 80,000 times larger. Dirt particles (lighter grey) being captured by an N95 Mask Filter. I used it to look at the dirty N95 masks to see how they trapped particles. Many filters work by having holes that are smaller than what they want to filter out. 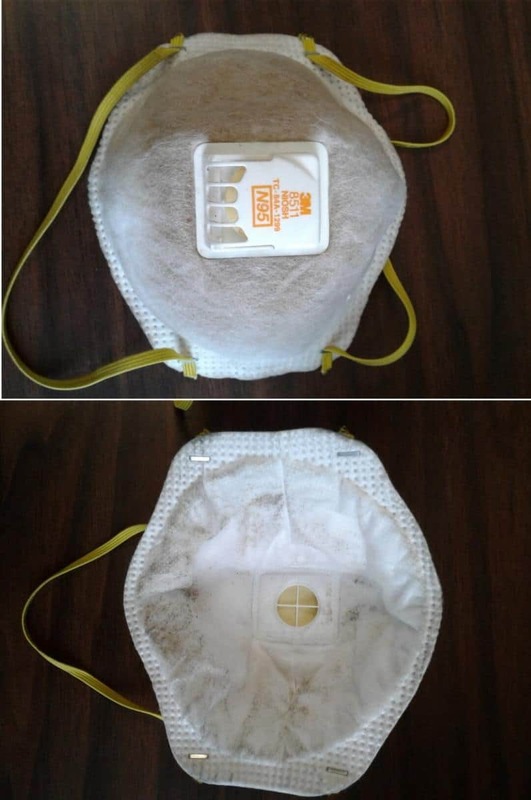 Since the N95 mask is used to filter out extremely tiny particles and it's not necessary to filter out every single speck, it takes a different approach. The filter is a tangled mass of jumbled up fibers laid on top of each other. 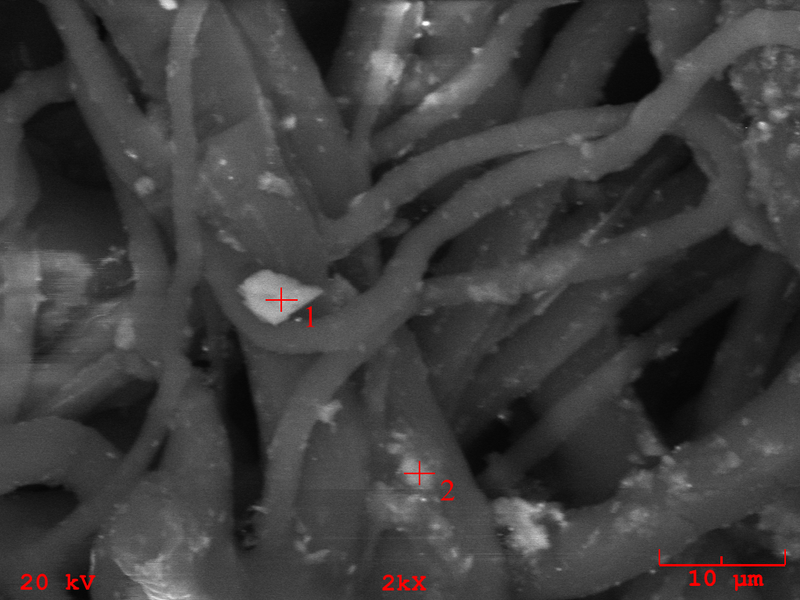 As air passes through it, the particles in the air have a good chance of bumping into one of these fibers. When they do, they get stuck. Because the N95 works this way, the filter does not clog easily and will still work nearly as well even when it's dirty. If you're thinking that 95% is not quite good enough, there are other masks that filter even better. N99 respirators filter 99% or more of non-oil-based particles, but they also have a few downsides. To have a better filter, the masks use denser material and have a better seal which reduces air flow making your lungs work harder. This is especially noticeable if you are wearing the mask during physical activity like cycling or working in dusty environments. The other issue is the cost. For that extra 4% N99 masks will cost more, sometimes quite a bit more. I purchased 3M's 9332+ N99 mask to test out while I cycle to work after I read some high praise from My Family Health Guide on Quora. It was noticeably more difficult to breathe than an N95 mask but not prohibitively. As with the N95 mask, I could still smell things like car exhaust and diesel fumes. Since N99 is not resistant to oil, the pungent oil-based particles in gas and diesel will still go right through. The mask actually worked very well for a while, but after a week of twice daily riding the nose seal stripped off. Not a huge deal since it still worked, but after 2 weeks the head strap broke. At upwards of $15 per mask, it seems they could have used sturdier elastic. The filter still works perfectly, but they want you to buy more. The 3M N99 mask that I tried was far too expensive to justify purchasing it. If you want to upgrade to N99, I suggest the Amston 1811 N99 mask. The N in N95 mask means that it filters out (N)on-oil-based particles. The P in P100 means that the mask is oil (P)roof. A P100 mask will filter out 99.9% of any and all particles .3 microns or larger no matter if they're oil-based or not. So what particles are oil-based? The majority of common particles you want to protect yourself from are non-oil based. Things like contagious diseases, dust from wood, sanding, insulation, etc. are non-oil based, but diesel and gas fumes from vehicles have a large oil-based component. One thing I noticed immediately while wearing the P100 in traffic is that I couldn't smell the exhaust fumes anymore. It stopped me from feeling like I was breathing out of a tail pipe on my bicycle ride to work. The major downside of a P100 mask is that it is very uncomfortable while breathing hard. The mask really needs a couple stiff bands in it that hold it away from your face because every time you breathe it collapses onto your face. The P100 mask's seal is made of a wide strip of rubberized foam that really stops any leakage around the edges, but also doesn't let sweat escape. As a consequence, the mask feels hot and stuffy to wear. NOTE: Many P100 respirators are permanent masks with replaceable filters. I did not test the replaceable filters, only the cloth masks. The 8511 vented mask is the best N95 mask I have found, and one of the top rated N95 masks on Amazon. The filters work well for catching dust, pollution, bacteria, and viruses. They also stay effective despite long, intense usage. If you are purchasing a mask to prevent others from catching a sickness that you have, make sure you buy a mask without a vent. N99 masks are useful if you notice that N95 masks are not working well enough for you, but try an N95 mask first. If you do end up choosing the N99, Amston 1811 masks are very good and only slightly more expensive than an N95. P100 respirators can protect against oil-based particles like exhaust fumes, but are also uncomfortable to wear for long periods of time or while doing hard labor. "Ambient (Outdoor) Air Quality And Health". World Health Organization. N. p., 2017. Web. 19 Apr. 2017. "Fine Particles (PM 2.5) Questions And Answers".Health.ny.gov. N. p., 2017. Web. 20 Apr. 2017.